Discovery shuttle astronaut Steven Bowen trains for the two spacewalks of NASA's STS-133 mission to the International Space Station before flight. This story was updated at 11:34 a.m. ET. HOUSTON – Two of the space shuttle Discovery's astronauts floated outside the International Space Station today (Feb. 28) to upgrade the orbiting lab with a power extension cable and perform other vital tasks. Shuttle astronauts Steve Bowen and Alvin Drew completed their preparations ahead of schedule, and were able to get started early. The astronauts switched the batteries on their spacesuits on at 10:46 a.m. EST (1546 GMT), signifying the beginning of the spacewalk. The outdoor excursion, which is the first of two planned during Discovery's STS-133 mission, is expected to last about 6 1/2 hours. Bowen is distinguishable by the red stripes on his spacesuit, whereas Drew is wearing a solid white suit. 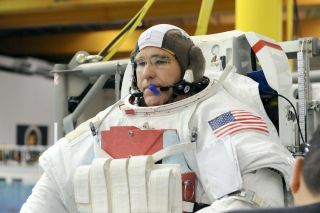 Bowen, who is an experienced spacewalker, was a last-minute crew replacement for astronaut Timothy Kopra, who was injured in a bicycle accident less than six weeks before Discovery's scheduled launch. Kopra, who was to be the mission's lead spacewalker, helped train Bowen to take his place after he was sidelined by the injury. The injured Kopra is staying involved in today's activities, however, by providing support to the spacewalkers from mission control at NASA's Johnson Space Center in Houston. Today's spacewalk is the first of two planned for Discovery's mission. The second excursion is set for Wednesday. Discovery, NASA's most traveled space shuttle, is making its final flight on this mission before being retired along with the rest of the shuttle fleet later this year. The 11-day mission will deliver a storage room and humanoid robot to the station. The first task for the spacewalkers is to install an extension cable between NASA's Unity and Tranquility nodes. This will provide access to a power source on the outside of the station once a new storage module, which Discovery delivered to the station, is robotically installed tomorrow (March 1). The cable will also act as a contingency power source for that area of the station if needed. Bowen and Drew will then prepare to move one of the station cooling system's defunct pump modules that had been temporarily stowed on an attachment bracket on the station's exterior. The ammonia pump broke down in August, but two station residents at the time, Douglas Wheelock and Tracy Caldwell-Dyson, were able to replace it with a spare during a series of emergency spacewalks. Bowen and Drew will transfer the broken pump module to a separate storage platform adjacent to the Quest airlock. NASA is hoping to bring the module back to Earth on a future shuttle mission – Atlantis' STS-135 flight scheduled to launch in June – so that engineers can analyze the problem. In the meantime, it will remain stored on the station's exterior. After the ammonia pump is secured to the storage platform, Drew will remove two tool bags that had been left outside during the spacewalks to repair the station's failed cooling system. The bags contain tools that will be used to vent any leftover ammonia inside the pump during the mission's second spacewalk on Wednesday. Bowen and Drew will then install a wedge under a camera on the station's truss that will tilt the camera to allow for better access when a spare part is installed in the area on a future mission. If there is enough time remaining, the spacewalkers will replace a piece of track for the rail cart system that is used to move cargo along the station's backbone-like truss. Finally, once all those tasks are complete, Bowen and Drew will complete an experiment, called "message in a bottle" for Japan's space agency (JAXA). For this task, Drew will capture some of the vacuum of space in a bottle to return to Earth.